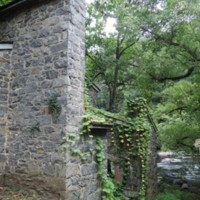 Exterior of one of the black powder mills on the Brandywine at the Hagley Museum. Eliza West, Photo of powdermill, Hagley Museum and Library, September 19th, 2017, property of the author. “Hagley Powder Mills,” DelaWARES.org, accessed April 23, 2019, http://delawares.org/items/show/122.